From the name of the theory one can conjure up that the Universe topology I am proposing is of a LightSpeed Expanding Hyperspherical Universe, that is, the three dimensional Universe is located in a very thin space disturbance that propagates outwards (radially) at the speed of light in four-dimensional spatial Universe. The fifth dimension is the Cosmological Time. Since the spacetime itself is a non-compact five dimensional manifold, there is a need for the three-dimensional spatial Universe, we are so used to, to be thin along the radial dimension. The thinness is consistent with a localized event (Four-Dimensional Big Bang) that set the Universe in Motion fifteen billion years ago. A thin travelling shell is clearly the remants of an above dimensional threshold event (Big Bang) that generated the Universe. This is also consistent with the lack of aberration we see in our Universe. If the Universe were set in motion by a longer lived event, there would be aberration, which is difficult to visualize. All forces we see are actually projections of the interactions that takes place in the five dimensional space. All forces including the ones associated with the most violent events in the Cosmos are just the result of interference patterns on a Four-Dimensional Hypersphere. In the papers contained in the Yahoo Groups site, you will find how using simple intereference patterns one can replicate Gravitation and Electromagnetism interactions. That said, it is time to introduce X Particles This is actually a solitonic normal mode of space oscillations. The soliton aspect is mentioned to emphasize its traveling and localized nature. Different particles would correspond to different modes of oscillation and rotation of the X particles. The fact that these are four-dimensional particles allow for three axis of revolution. The particle is a four-dimensional ellipsoid of revolution. Three axis of revolutions means also that spin, which is an intrinsic motion under current Science, becomes an extrinsic thumbling. The axes of this ellipsoid of revolution maps to the quark content of a particle. Negative quark (down quark) is mapped to a negative phase (180 degrees out of phase with the oscillations of positive axes) in spacetime oscillations. Now it should be clear that X particles are spacetime oscillators that thumble (spin 0) while traveling at the speed of light with the rest of the Universe (also composed ot X particles) along the Radial direction. Particles with spin zero do not thumble and correspond to surface modes generators of the traveling hypersphere. This theory revises the Standard Model with some interesting results, which will be review later, if there is interest. Now let’s investigate the first assumptions of the HyperGeometrical Universe Theory. Are we actually traveling at the speed of light? where m is the mass in motion. This is obviously the Pitagoras Equation for moments in two perpendicular directions adding into an hypothenusa aligned resulting momentum. The p momentum is our 3-dimensional linear momentum, while the m0C is the momentum perpendicular to our three dimensional space and it has a c-speed (the speed of light). This indicates that we can consistently travel at the speed of light perpendicular to our three dimensional space and that will explain the E=mc2 energy. Einstein did not realize the possibility of a hyperspherical expansion. Without that insight, the E=mc2 formula has no underlying reason for being.The energy has to be stored somehow, either as kinetic or potential energy and the storage mode has no connection to Relativity, that is, Relativity provide no guidance to how Nature store the famous nuclear energy. Without guidance, Science followed the potential energy paradigm, but missed the infinitely simpler and more elegant kinetic explanation. This theory tries to correct that misdirection. This means that the nuclear energy is explained as being of kinetic nature and that precludes any potential energy stored in the form of strong or weak forces. Needless to say, this is a great simplification and that is why it is a good idea to take one step back before moving forward in this area. In fact, the projection paradigm presently used, can be stretched further using the guidance of the hyperspherical topology, although that doesn’t seem to be the best usage of it. Talking about the meaning of time will require a Thought Experiment and that will address only what I called the PROXY OF TIME. c.t1 and c.t2 are proxies of time in the Lorentz transformation. They are proxies because they do not reflect time flow itself but are a artifact of multidimensional wave decomposition. I call them dimensional time in my papers. Consider yourself as Being an Amoeba Stuck to the Surface of an Upwards Traveling Air Bubble (Traveling from the bottom of the sea to its surface) to understand it…:) … You will also have to understand the concept of Proxy…. Remember that Chemical reactions will increase their rate as the temperature increases (in general, just go along and don’t sweat the fine stuff). This means that the Amoeba will speed up as the temperature increase and temperature is increasing function of height from the bottom of the sea. This means that the PROXY OF TIME will speed up as it travels upwards. Let’s say that the Amoeba knows its biological clock (rate of replication) and can measure the passage of time by measuring how its colony grows. This Amoeba, looking on a telescope, will see another bubble with other Amoebas and conjure up some theory of how time passes as you distances from each other (vertically). A very complex theory will be derived. The theory would be simple if the Amoeba knew it was traveling upwards and the temperature profile and the rate of acceleration of their biochemistry with temperature. Notice that chemistry is what controls their sense of time. In our case, velocity (local spacetime distortion) controls the speed of all forces, which in a Grand Unification Theory as this one, is just one. Fortunately we have a simpler problem. We are also dealing with relative speed, height and its influence on the PROXY OF TIME passage. Similarly to the Thought Experiment, there is a height (distance traveled by the HyperSpherical LightSpeed Expanding Universe) since the Big Bang (circa 15 Billion light years) and there is a relative measurement to be made. In the Amoeba case, it was the relative distance (PROXY OF TEMPERATURE DIFFERENCE). In our case it is a relative imaginary angle difference. 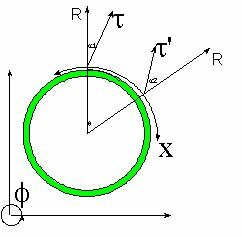 Lorentz transforms are equivalent to a rotational in a four-dimensional space, but they can easily be understood as a rotation in a five dimensional space, where the new direction (dimension) reflects the existence of an absolute time and a Radial direction (c.t1). Any inertial reference frame corresponds to a rotational of an imaginary angle around the Cosmological Time Direction. Since we don’t have any reference to be able to see what lies outside our thin Universe crust, we can’t never see the Radial propagation or have an idea of where is this preferential direction pointing towards. We can measure only the angle difference between two bodies in this 3-dimensional crust. This means that we are in the same boat as the Amoebas Stuck Inside Raising Bubbles and can only measure relative time passage. The other conclusion is that Lorentz transformation corresponds to a rotation by an imaginary angle between the reference frame and a Radial Direction and that any system in this Universe would be traveling at the speed of light radially. Figure 1. Shows the cross-section XTau for the expanding Universe. The Universe length along X is represented by the band. X (or Y or Z) is displayed along the perimeter of the circle. Also shown in the diagram is PSI (Cosmological Time) and Radial Time R.
It is clear that space is curved in this model and that the radius of curvature is the dimensional age of the Universe (age of the Universe times the speed of light). Notice that it corresponds to a rotation of an imaginary angle around a direction that is perperndicular to x2 and t2, not unlike a rotation around F the Cosmological Time coordinate. Notice that the concept of time flow depends upon the angle between c.t1 and c.t2, which are represented by tau and tauPrime in the diagram.